Poll: Should Hermits be Added to Minecraft? If you've seen me around the forums, you would know that a couple of years ago, I made 3 suggestions about a "hermit" and each of those were blasted for being way too unbalanced. Now, I've come back with a much better suggestion for it. Hermits have 20 health points and are damaged by the same things as the player. They are usually neutral mobs, although they have a 5% chance of being aggressive to the player. Hostile mobs attack hermits and they can attack hostile mobs if they have a weapon. Hermits have the same 36 (37 if you count the offhand) inventory slots as the player and can equip armor and weapons (including bows) but not elytra. They usually have in their inventories: 0-15 dirt, 0-64 cobblestone, 0-5 rotten flesh, 0-5 logs, 0-12 sticks, 0-32 arrows, and 0-4 saplings; the mobs also have the same rates of spawning with weapons and armor as zombies. They will pick up any item on the ground and will drop everything in their inventories upon death. In some cases, they can raid chests for food, weapons, and potions and can eat and take them if low on health. which are 12 times as rare as villages. They generate in these biomes although the materials of the house will vary. where the tunnel can range from a few blocks long to reaching the lava level. This mine, however is aesthetic, so no ores will be excavated. In the chests, you don't get things which are that valuable, however, in 18% of hermit huts, there is a secret chest in the ceiling where you can get things like diamonds. In all difficulties except peaceful, hermit run into the nearest door like villagers. Also noting that there will be a baby version of a hermit, which is a baby zombie model with the arms down, but you can only get it by right-clicking a it with a spawn egg. You know what? I like this. It's balanced, useful, and cool. Support. •If a hermit lacks both a mine and a farm, they are in the early game. They get a stone sword and bow with limited arrows. They whip out a shield if the player shoots an arrow at them. •If a hermit has only a mine or only a farm (50% chance of this happening) they get an iron sword and bow with many arrows. They occasionally have iron armor. •If a hermit has both (25%) they get a diamond sword and bow with poison arrows. They occasionally have diamond armor. Chests do not change they are balanced as is. The main point for this is so the hermit is a genuine threat. Better to build your own house then go to them on the first night. I'd up aggressive hermits to 20%, and change the way the others are neutral. If you as much open a chest or furnance in their house, they will attack you. When the player is loading the chunk home to a hermit, I think they should act a bit more natural. They will replant crops and attack hostile mobs. At night they may stay outside should they have diamond. This only occurs if the player is nearby. Zombie invasions occur to prevent players from moving into hermit homes. Next, I think the hermit should have a "trust" meter similar to village popularity. At first they watch the player with skepticism, but for every 8 monsters you kill near the hermit the more they trust you. Should you do any of these before you reach the level where it is acceptable, you'll lose 2 points. Attacking the hermit will automatically put you at 0 (except for 6, where hitting them twice puts you at 0). Give a golden apple to a hermit at 0 will put them to level 1. In this way, the player can form "alliances" with hermits inspired by the current villager system (though more useful than better trade deals). With level 8, you can destroy their bed and they will follow you to your base (where you must place their beds for them to "move in"). The hermit-ally won't directly serve you, but they will randomly go out hunting and tend to your crops. This gives them a much needed use, although you will need to put in some time before they agree to ally. ...Next, I think the hermit should have a "trust" meter similar to village popularity. At first they watch the player with skepticism, but for every 8 monsters you kill near the hermit the more they trust you. I really like the idea of having a friend in survival! Edit: I see a lot of potential in this, If the hermits could build/destroy blocks and data packs work the way i think they do, it would be possible to have a programming contest were people use their version of hermit AI to race to a diamond or something! Wow, these are much better reactions than I expected. Are there any problems with this suggestion I should be aware about? I agree with fishg about the trust system, but I think it would be a better idea to also have trust build up over time. Such as gaining one point for every 10 days near a hermit. This is the only part I disagree with. As stated above the hermit will drop their entire inventory. It doesn't matter if the hermit has a diamond sword, it just matters how well the player knows the A.I or how good the player is at dodging. The A.I is already going to be very complicated so adding advanced combat would be too complicated. Besides, even if they add it in if the player knows the A.I well enough they will be able to overpower it. 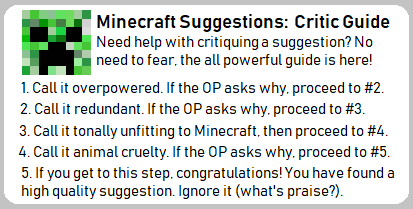 I like the idea of having your own friend in Minecraft, but adding another human mob seems unnecessary. Maybe these features can be integrated with villagers. Pandas have personalities so why shouldn't a human mob have personalities. Villagers could be hired or friended somehow and each could provide a service. A bow with poison arrows is very dangerous, as just one hit leads you to a one hit kill. And while a more advanced player should have no problem against a hermit, it might prove those in the early game quite the challenge, encouraging them not to go on a mass murder spree. That being said, this suggestion is over half a year old and with Village and Pillage just around the corner I would argue this suggestion redundant and therefore must withdraw my support. Sorry for kinda necroing this post. About the poison arrow, it's incredibly easy to dodge arrows shot from an A.I so it doesn't matter how strong they are. Plus it gives the player them once it's dead. This seems like a more developed version of witches and witch huts, I would recommend you just take the two and combine them if you want Mojang to notice, as they are changing witches around a lot right now.